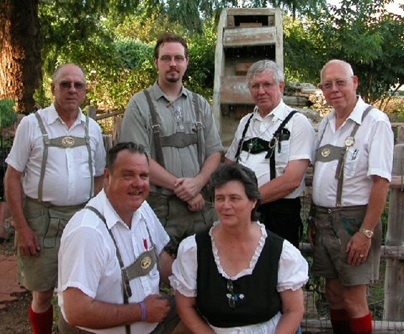 I had a chance to visit with Roy Haag (front row, left) recently to talk about the Bohemian Dutchmen’s performance at the International Accordion Festival in San Antonio a couple of weekends ago. Roy mentioned there was a nice article about the orchestra in the San Antonio paper. They also have a fundraiser coming up on Saturday, November 5--Musikfest German Concert and Dinner featuring the Blasmusik Texas All-State German Band and of course, the Alamo Angels. Click here to get more information. As for the Bohemian Dutchmen performances, Our first one was cut short by a long-winded emcee and our second performance on another stage was rained out. But we were proud to be there to represent German-Czech music,” Roy said. In addition to the Bohemian Dutchmen, Roy is the leader of the Litt’l Fishermen. It’s been a busy Oktoberfest season for the bands, mostly for private functions. Roy’s Internet radio shows are going strong as well. He is one of three DJs who presents a weekly show on www.NBGermanmusic.com. And he and his son-in-law, Donnie Howard, produce another weekly Czech-German show atwww.polkavariety.com. Roy says he has listeners from all over the world and his stateside audience is mostly from Wisconsin, Nebraska and Texas. And I was happy to hear that four out of the five DJs doing the shows mention polkabeat.com. Hmm, I need to find out who the holdout is and do some sweet talking!